One of the issues which has emerged from previous Talking Mats and dementia projects is that many people with dementia experience difficulties with mealtimes and that it can affect people at any stage of dementia. Mealtimes involve two of our most fundamental human needs, the basic physiological requirements for food and drink and interpersonal involvement. Mealtimes are particularly important for people with dementia as they may develop difficulties both with eating as a source of nourishment and with the social aspects of mealtimes. In 2015 Joan Murphy and James McKillop carried out a project, funded by the Miss EC Hendry Charitable Trust, to gather information from the first-hand experience of people with dementia about their views about mealtimes. We ran three focus groups and used the Talking Mats Eating and Drinking Resource to allow participants to reflect, express and share their views. The people who took part in this study felt that there were significant changes in their eating and drinking since their diagnosis of dementia. For some, their experience of mealtimes had changed and several said that they now skip breakfast and sometimes lunch. For some this seemed to be related to forgetting to eat and drink, for others it related to changes in taste whereas for others these meals seemed to be simply less important. Forgetting to eat was particularly noted by the participants with dementia and confirmed by their spouses. The social aspect of eating and drinking also changed for many of the participants and, given the importance of social engagement for quality of life it is important to be aware of the effects of changes in eating and drinking on mealtime dynamics. For some it may be that they are now less interested in the social aspect of eating with others at home. Others found it hard to eat out because of distractions and lack of familiarity while some felt embarrassed about eating out in front of strangers. Others still really enjoyed going out for meals but added that they preferred to go somewhere well-known to them. The shared mealtime may be a particularly crucial opportunity for social engagement as it plays a central role in our daily lives. Social relationships are central for not only enhancing quality of life, but also for preventing ill health and decreasing mortality (Maher, 2013). Their feelings about the texture of food did not appear to have changed significantly and was simply a matter of preference. Three additional health issues which the participants felt were connected with eating and drinking were poorer energy levels than before their diagnosis, reduction in ability to concentrate and changes in sleep patterns. This entry was posted in Blog, Dementia, dysphagia, Eating and drinking, Participation, Research and tagged Dementia, Dysphagia, Eating and Drinking, Participation, Research, Talking Mats on January 7, 2016 by Joan Murphy. This app has a number of great new features which many of you have been asking for. 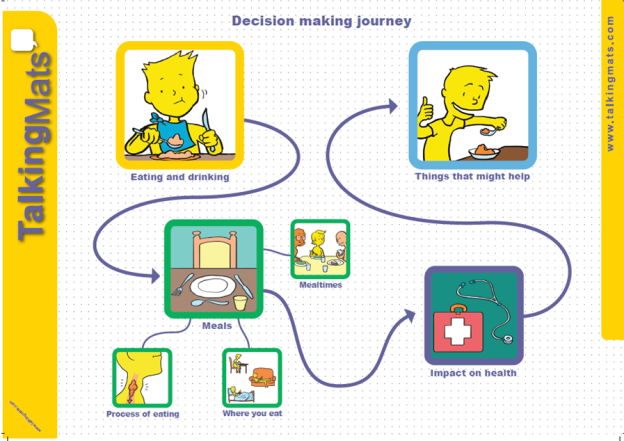 There are two new resources – Eating and Drinking – which has 3 main topic sets - Meals, Impact on Health and Things that might help. The second new resource is Social Care which includes the topics Activities, Where you live and You. There is an amazing new feature which many people have been asking for. Version 2 allows you to add your own images from your camera roll. This means that you can add you own personalised pictures to any of the topics. Watch out for next week’s blog when Lois will tell you about her holiday using this new feature! You can now also reset your password, use the Back button to navigate through the app, delete individual sessions and use the updated report page. If you have already purchased the gold version of the Talking Mats app you will get all these new features for free. This entry was posted in App, Blog, Digital Talking Mats, Eating and drinking and tagged digital, Eating and Drinking, Personalisation, Talking Mats on May 7, 2015 by Joan Murphy.